Legacy Emanuel Medical Center in Portland, OR, is a full-status Level 1 Trauma Center and home to the Level 1 Legacy Oregon Burn Center, the only burn center of its kind between Seattle, Sacramento and Salt Lake City. We are also a Level 3 NICU, the highest acuity level for infants that includes the most premature neonates at 23 weeks’ gestation, and a certified stroke and cardiac care center. The hospital is also recognized for “The Corridor of Life” physical layout of our trauma department—a unique floor plan that has four trauma resuscitation bays, two trauma operating suites for patients who need to go directly to OR, and full radiographic services centrally located right in the ER/trauma unit. A Neurotrauma ICU (NTICU), Cardiovascular ICU (CVICU), and Trauma Recovery and Acute Care Unit (TRACU) are directly adjacent on different floors in the ER wing. There is also a hybrid cardio/angio cath lab OR suite connected to the ER/trauma department. Imaging services are an integral component across our many clinical departments and services. Many of our patients have multiple co-morbidities and we often rely on portable X-ray as an indispensable tool for capturing information on these critically ill patients at the bedside. In fact, we have more critical care beds than medical surgical beds in our facility. With a high patient acuity level, we have routine morning imaging rounds where we utilize portable X-ray at the bedside. On average, this includes: 19-20 patients in our 24-bed NTICU; 10 patients in the 12-bed CVICU, and five in the 15-bed OBC/burn unit (7 ICU beds and 8 noncritical beds. In the PICU (24 rooms) and NICU (40 rooms), an average morning can include up to 17 bedside portable X-ray exams, with numerous portable X-rays being performed in all units throughout the day as situations arise as well as numerous other non-ICU units where portable DR is utilized throughout the day. On average, we perform nearly 2,000 portable X-rays each month, including those performed in our nine-story Randall Children’s Hospital at Legacy Emanuel. Although the use of portable X-ray is a frequent occurrence, even our routine work is not routine. Seconds count when we are trying to save a life and imaging is one part of that puzzle to help get the patient stable. Our clinicians depend on us to deliver fast, reliable imaging that they can use to diagnose the issue and determine next steps. In fact, many of our Level 1 trauma cases—those with penetrating injuries or wounds—bypass the ER and go straight to the OR, and we follow them with our digital X-ray. In 2014, we embarked on a project to standardize our portable X-ray equipment and replace our older analog systems with DR. At that time, only four of our 15 units were DR. We looked for that hard-to-find combination of a technologically savvy, user-friendly and durable system—our units are used all day, every day, in some of the most extreme environments. Other key qualities included high image quality and dose reduction. 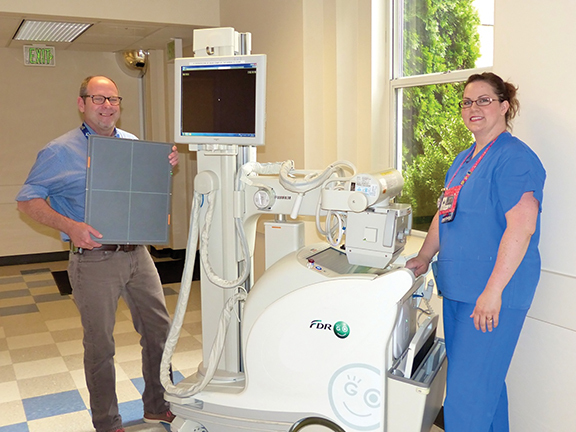 After evaluating six vendors and a variety of solutions, we chose the Fujifilm FDR Go, a small-footprint system that is easy to maneuver in tight areas, enables low-dose portable exams and offers easy-to-use features, exam tools and shortcuts such as Virtual Grid. In February 2015, we implemented three FDR Go portable DR systems in the adult ER/trauma unit at Legacy Emanuel to complement the one existing FDR Go in Randall Children’s Hospital. Virtual Grid was a key factor in our decision-making process. It automatically adapts the image processing to replicate grid use to reduce degradation of the image quality caused by scatter radiation. We often don’t have much information on incoming patients from emergency responders, and in many cases we also don’t have the time to place and then line up a grid behind the patient. Since we often don’t know the patient’s size or habitus, we may not even have the correct grid ready to use when the patient arrives. Yet, we can’t compromise image quality—our emergency physicians and surgeons depend on these images to make the right patient treatment decisions quickly and safely. We’ve also found that Virtual Grid can help reduce artifacts due to a misalignment of the tube to the detector angle. That we no longer have to rely on the placement of a grid, in addition to the plate, has made a difference in both our workflow and repeat exams. Virtual Grid is easy to use and streamlines our workflow by providing two options for use: we can either select to automatically process the image with Virtual Grid right from the main exam menu, or we can select to post-process with Virtual Grid after the image is captured. With either method we’ve found the image quality to be excellent. Our clinical workflow is also streamlined—our surgeons now rely on that instant image processing to make decisions on whether a patient needs immediate surgery, should be intubated or should receive a chest tube. In fact, our neurosurgeons now specifically request the FDR Go interoperatively for any surgical lateral spine cases. Our department has also reported fewer repeat exams, which most often are the result of poor image quality. While it was difficult to obtain statistics on repeats when using film, we began charting this data when we implemented our first DR room in 2009 and again with our first portable DR in 2011. 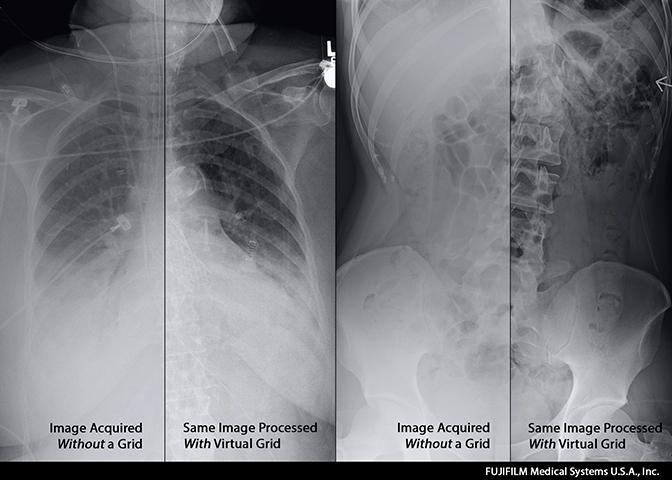 Initially, our portable X-ray study repeat rate was often around 7-8%. Today, it is as low as 4.2% with a target to achieve less than 2% repeats on portable DR exams. This saves us valuable time as well as unnecessary cost and radiation exposure to patients. Continued training also plays an important role in the high image quality and low repeat exam rate. We recently completed a refresher course for our technologists, and they all echoed their amazement that one button—the orange VG—does it all in one simple step. To understand Virtual Grid, you really have to see it in action—it’s not smoke and mirrors. Virtual Grid is used in 90% of all portable chests, and 75% of abdomens. Patients over 400 lbs. are imaged with an actual grid due to their body habitus. Recently we implemented a dose monitoring solution across our imaging department. Keeping the dose low even in portable DR is important, as many of our patients receive serial imaging over the course of several days. The FDR Go is part of our dose management initiative. Going from analog to FDR Go, we’ve cut patient dose by 70%. Also impressive is that we’ve reduced dose by 30% when moving from CR to DR and 17% when moving from another vendor’s DR to the new FDR Go. Recently we compared nongrid to grid and Virtual Grid studies, and discovered that on an average 150- to 200-lb. patient, nongrid (chest) studies averaged 90 KVP @1.6 mAs, actual grid studies for patients up to 350 lbs. averaged 110 kvp @ 8-10 mAs and Virtual Grid fell right in the middle of these two, averaging 110 kvp @ 5 mAs. The results demonstrate that we can lower patient radiation dose on the FDR Go with the Virtual Grid or when using a standard no-grid technique. The FDR Go with Virtual Grid has withstood the rigors of our hectic, 24 x 7 emergency/trauma department. It has been bumped, jostled and stressed to the max, yet it continues to generate exceptional image quality and keeps up with our “crazy medicine” workload. Virtual Grid is an unbelievable clinical application that helps us swiftly image even the most critically ill and injured patients and delivers the high-quality images that our clinicians depend on each day to keep saving lives. Case Review: Legacy Emanuel Puts FDR Go and Virtual Grid to the Test with Trauma Patients in Demanding Environments. Appl Radiol.